The main feature of power is that it inevitably creates resistance, a process Foucault studied in detail. There are no harmonious societies. Conflicts of interest between different social groups have been a constant throughout history, and are probably the main driver of social change. Counter-power emerged as a means of collective action whereby the injustices suffered by subordinate or oppressed social groups become politicized, either in the form of silent rebellions that remain latent in everyday life or through challenges that are publicly and openly declared. The forms this collective action takes have varied over time, due to factors such as technological developments, cultural changes or socio-institutional processes. The idea of counter-power has always been ambivalent: on the one hand, it is defined negatively by its capacity to say NO and prevent the hegemonic elites from carrying out their agenda; on the other, it transmits an assertive strength, a capacity to say YES and deploy new sensibilities, desires, ways of organizing and alternative lifestyles. Destituent and constituent power are two sides of the same coin. Our cognitive reflexes tend to associate social struggles with images of revolts, mass mobilizations and epic insurrections, where conflict is dramatized. In the urban context, its mythological architecture would be the barricade – an ephemeral construction that symbolizes two worlds in conflict, made of the magic cobblestones that rise up to form fortressesdescribed by Baudelaire. But what if, rather than the barricade, we were to think of counter-power in terms of a space such as a community garden? We would speak of defending the existence of spaces where the lives of local communities and plants are cared for, food is grown and social relationships are harvested, of neighbourhood and environmental ecosystems threatened by the market and urban policies. 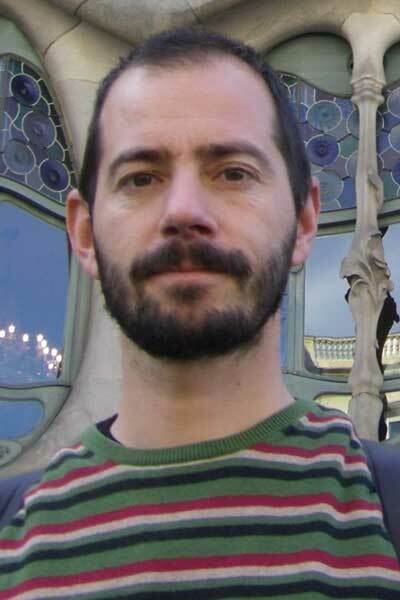 Emmanuel Lizcano used to say that metaphors and images unconsciously shape our thought patterns. In our case, this could lead us to think of social conflict in an excessively mechanical way. Counter-power would be reduced to a lengthy process of building hegemony and the accumulation of forces capable of successfully confronting established power, until Gramsci’s ‘catastrophic equilibrium’ is broken and counter-power becomes the new legitimate power. Let’s think of the workers’ movement with its unions and parties, consumer and worker cooperatives, mutual societies, newspapers and magazines, folk schools, cultural centres and libraries, people’s houses, choirs, bands, excursion clubs, theatre groups, women’s associations, mutual support networks in neighbourhoods… We will find a whole world run according to its own principles and rules – a constellation of community institutions where people could socialize, practise solidarity, and reproduce a culture and lifestyles that operate independently of power. Does it not seem reductionist to think that this complex multiplicity, overflowing with life, was a mere exercise in the accumulation of forces awaiting the day of the revolution? Counter-power interests us because it refers to inhabiting a conflict without being obsessed with confrontation, and acknowledges that building new social relations can be a gesture of radical defiance. This connects with historical socialist and anarchist tendencies whose efforts were aimed at developing initiatives and projects that foresaw what a non-capitalist society would look like. Long ago, the Labour Party activist G. D. H. Cole wisely stated that the revolution should look as little like a civil war as possible and as similar as possible to a record of events and a culmination of existing trends. This is why we will emphasize the positive, constituent dimension of counter-power and track experiences that are able to transform our cities and people’s lives, bringing about small-scale radical changes at the same time. We will follow the trail of the real utopias studied all over the world by Erik Olin Wright, where what is pragmatically possible depends on our imagination and takes shape based on our visions of reality and our ways of inhabiting it differently. Just as the escaped slaves in Brazil founded settlements hidden in the jungle, known as quilombos, in our concrete jungles today there is a wide range of modest counter-powers that are hidden, undervalued and kept out of sight. We will mention a few of them and then focus on one example: community gardens, specifically in Madrid. The financial crash that began in 2008 put an end to the illusion of a model of economic growth increasingly disconnected from meeting social needs. Cities have borne the brunt of the dramatic social and economic impacts of the crash (household debt, evictions, high unemployment, energy poverty, inability to afford food, deterioration and privatization of public service, etc. ), which have given rise to a serious loss of social cohesion. This process was aggravated by the application of an austerity urbanism that opened the door to the private sector in service provision and management, giving it an ever more important role in the definition of strategic guidelines for urban transformation. This restructuring of urban policies is based on processes such as the promotion of megaprojects and mega-events, public–private partnerships (PPPs), opening up the most interesting sectors to foreign investment, unequal public service provision depending on the purchasing power of different neighbourhoods, gentrification, and the commodification of sectors such as environmental management, green areas or even the public space itself. Investors, property developers and large corporations have driven the creeping commodification of the city, with the result that markets – disconnected from social needs and free from political oversight – determine the direction taken by urban governments. And citizens have suffered the dramatic consequences: market authoritarianism and the erosion of local democracies, booming corruption, an increase in environmentally unsustainable processes and an exponential growth in inequality. This cyclical movement throughout history has provoked the activation of society’s self-protection mechanisms, in what Polanyi defined in The Great Transformation as a ‘double movement’. The threat of a free-market utopia generates antibodies capable of repoliticizing everyday life and deploying multiple alternative projects aimed at subordinating the economy to politics. The official narrative of the crisis began to be questioned publicly in Spain with the emergence of the 15M movement in 2011, which launched the most intense cycle of collective action in the country’s recent history. The protest camps and assemblies formed micro-cities at the heart of a larger city in a sort of project proposal for other cities, generating an atmosphere more favourable to social change. Against austerity urbanism, what emerged from civil society was cooperative urbanism, intensive in its capacity to innovate to solve problems, citizen leadership and more democratic ways of understanding the public sphere. In Spain, responses to the crisis have taken different forms: campaigns to stop evictions and recover homes, led by the Platform of People Affected by Mortgages (Plataforma de Afectados por las Hipotecas, PAH); citizen tides in defence of public services such as health and education, bringing together users, professionals and trade unions; the restoration of buildings to set up community centres; the organization of food banks for vulnerable families; neighbourhood support and solidarity networks against the exclusion of migrants from health services; or the takeover of abandoned properties to plant community gardens. The greatest successes of this plurality of counter-powers have been to discredit the story about the crisis; to put a stop to the most aggressive policies to privatize health, education or water; to popularize acts of civil disobedience (stopping evictions, occupations, refusing to pay higher taxes on medicines, medical care for undocumented people); to present popular legislative initiatives aimed at changing the legal framework, the outstanding example being the PAH proposal on the right to housing; and to develop a non-hegemonic use of international law, leading to several condemnations of the Spanish state for human rights violations. This is not just defensive action against the loss of rights and the lack of resources and basic services, but a recovery of collective thinking and proposal-making. This cycle of mobilization has consolidated a modest, imperceptible geography of resistance that takes the form of different ways of thinking about, imagining and inhabiting the territory. Whether intentionally or unconsciously, in solving problems counter-powers tend to promote alternative urban models where different lifestyles can develop. They do this by re-signifying and politicizing concepts such as the neighbourhood or the public space, and by producing places where new social and practical relationships can be (re)built: community centres, community gardens, community-run equipment, the reinvention of empty or under-used public spaces. Living in a different way implies the material construction of arenas where – albeit on a small, fragmented scale – it is possible to reproduce other patterns of relationships among people and between people and their surroundings. This citizen counter-power was enacted in the protest camps that from 2010 onwards spread to large cities all over the world, from Tahrir Square to Madrid’s Puerta del Sol, from Occupy Wall Street to Gezi Park, as people demanded more democracy and rose up against ‘austericidal’ policies. With thousands of people living side by side in the protest camps, the public space was seen as a collective, political site. The occupation of this space was ‘potentially permanent and self-managed’, making it a metaphor of another way of inhabiting the city, reinventing the public space as a common space, ‘a performative representation of justice and equality’, where people could protest in common, think in common, live in common and explore alternative values in common. The protest camps were structured as temporary cities, with different spaces for different activities and needs: children’s areas, libraries, communication and information centres, dining areas, solar panels. In many of these camps, between the tarpaulins and the assemblies, community gardens somehow also found a space that was sometimes symbolic or evocative. 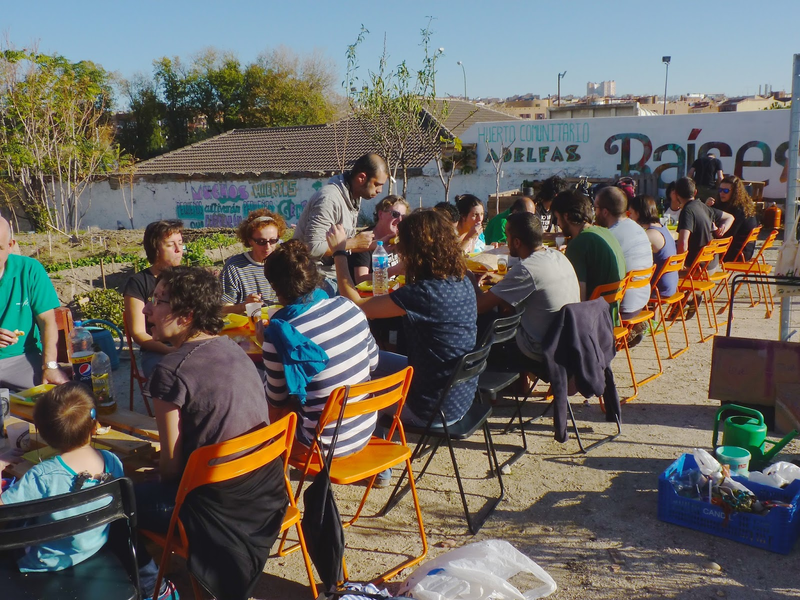 Spaces where the community living in the camp imagined itself and made plans for the future, such as in the Huerta del Sol in Madrid, where there was a sign saying ‘if we last 40 days we will eat lettuces’. A new community is invoked around the idea of the garden, rethinking relations and symbols in places affected by conflict. Thus, Greek and Turkish Cypriot activists from Occupy the Buffer Zone in Nicosia set up camp on the disputed land. One of the ways they took ownership of this space, left a mark on it and gave it a new meaning was the Greening up the Green Line action, which involved building a small vegetable patch and ‘seed bomb’ workshops. These actions sought to give a new meaning to the green of the so-called green line (the demilitarized zone that separates the island), turning it into a cultivated landscape. These were temporary, shifting spaces, designed to highlight political demands and make links with other movements and spaces that were already there. 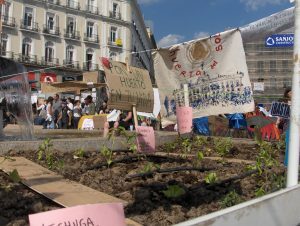 Thus, in Occupy Rome, the city’s guerrilla gardening groups and community garden (CG) collectives, organized their first joint action with the design and construction of the Orto Errante, based on movable vegetable patches; Occupy Wall Street organized workshops and guided visits to the community gardens in the Lower East Side; in Barcelona, the agroecology movement attended various protests with a nomadic garden, which ended up being seized by the police; and Occupy San Francisco planted an organic garden opposite the headquarters of Monsanto. Elsewhere, the protest camps led to starting up projects that aimed to be permanent, such as Occupy the Farm, an urban farm on an occupied site in the University of California, Berkeley, or the People’s Peas Garden located in a public park and run by Occupy Gardens Toronto, which was active for five months until it was dismantled. 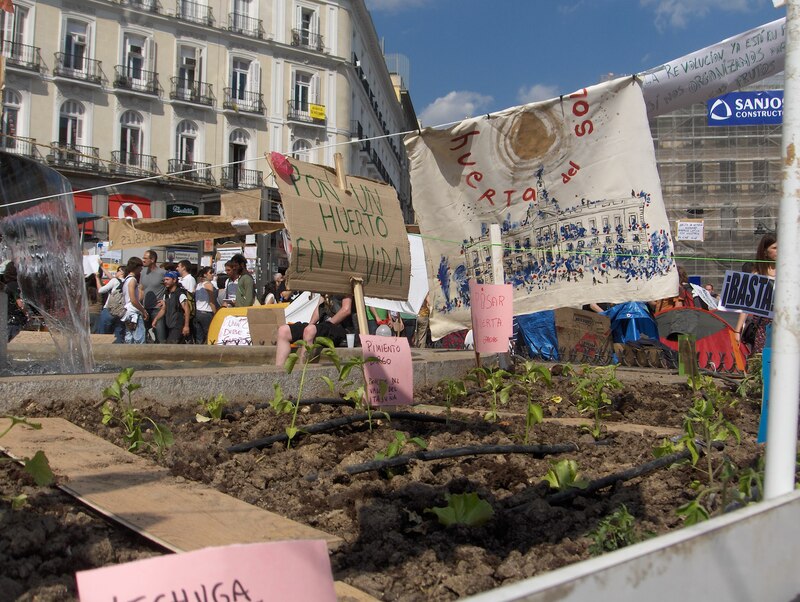 After the camps were taken down, the seeds of ideas planted by these gardens germinated elsewhere, as illustrated by the Puerta del Sol camp, which was dismantled to shouts of ‘We’re not leaving, we’re moving to your conscience’. 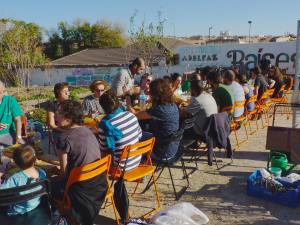 So, when neighbourhood assemblies in Spain start to work on their local environments, they often develop community garden projects. This has happened from Madrid and Barcelona to Burgos or Málaga, where the very name of the gardens reflects those origins: Horts Indignats in Barcelona, Huerta Dignidad in Málaga (in reference to the 2014 Marches for Dignity). Community gardens emerged as one of many forms of protest against the malaise caused by the neoliberal global city and its urbanicidal dynamics (too many institutions and not enough government, exclusion and the dual labour market, the politics of fear, deteriorating public services, unsustainability and so forth). Urban agriculture has become a means to denounce speculation and demand a new culture of the territory. It has also enabled the creation of social and economic alternatives linking a wide range of social actors and collectives, from green activist groups to unemployed people’s assemblies, from neighbourhood associations to popular solidarity networks. In common with other critical social movements, the community gardens presented their demands under the umbrella of the right to the city, understood not as a legal claim, but as citizens’ right to intervene in the city, to build it and transform it. This symbolic framework can be used to connect with other essential demands (against neighbourhood segregation and stigmatization, forced displacements, evictions, the criminalization of poverty) for imagining a socially just city, into which experiences like the community gardens incorporate issues such as urban ecology and food sovereignty. The urban agriculture movement reveals and poses questions that go beyond the gardens themselves, calling on people to participate and share responsibility for our lifestyles and how we manage resources that are located beyond the city limits but are essential for the city’s subsistence in a context of social and ecological crisis, exemplified by climate collapse and the energy crisis. Together with the right to the city, another central pillar in the ideas and practices of the urban agriculture movement is the notion of the commons. Indeed, the CG defined themselves as the urban commons from the outset. Thus, for Karl Linn they are neighbourhood commons, meeting spaces built and managed by people living in degraded areas of deprived neighbourhoods. The urban commons revive traditional practices of community management of natural, strategic resources the community needs to reproduce, and adapt them to the urban setting. One of the strengths that give the community gardens their radical nature and transformative capacity is their goal of creating a community in the broad sense, around sharing and collectively managing a space, resources (soil, seeds, water, tools), certain benefits (harvests, social recognition), and a group of people who define their own rules and organization. This has led to the community gardens also being defined as green urban commons: ‘green spaces located in urban settings, with diverse forms of ownership and a wide range of rights, including the right to create their own management arrangements and to decide who they want to include in that system of management’. 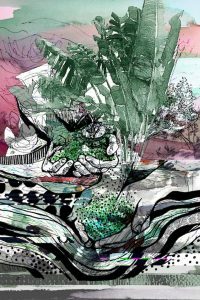 The community gardens are self-organized, non-hierarchical experiences that combine a critique of the dominant model of the city with the mobilization of emancipatory practices and ideas. Against the ideology of homo economicus, the idea of the community refers to the way in which people create their own community intentionally, reflexively and by engaging in dialogue, generating groups that see themselves as inclusive, open, flexible, porous and rooted in the neighbourhood. The neighbourhood is that sphere between the productive and the reproductive, between the private, known, domestic space and the public space, comprising the larger, more abstract city that cannot be encompassed in its totality. In the community gardens, the sense of belonging to the neighbourhood is defined culturally rather than geographically, seeking to involve and appeal to neighbours whose definition as a group is likewise flexible, as it refers to people who work collectively in the neighbourhood and not so much to their place of residence. This sense of community belonging that characterizes the urban gardens is underlined by a gardener from Madrid, an unemployed architect: ‘It’s not a question of each person having their own plot, or each person managing, working and harvesting a separate, fenced-off area. That’s something people find very unsettling – they’re surprised that you’d go and put in the work without knowing what you’re going to get out of it’. Because what is grown is not for commercial purposes, the gardens promote a sort of gift economy, where what each person contributes and what they receive is not quantified. Another gardener from the same garden explains it like this: ‘This spade is not mine, neither is this plant. Because all of it is everyone’s, I have more of a sense of belonging. It feels more important to me, I have to look after it and defend it more than if it was mine or someone else’s. It’s everyone’s space and no-one’s space – a common good that we can all enjoy but that doesn’t belong to us’. For another gardener, ‘Being a community means working more on the basis of questions than answers. Things get decided through consultation, nobody imposes their views’. For a gardener in one of Madrid’s oldest gardens , Adelfas, the community garden is ‘a place where we can go back to what a neighbourhood used to be, talk to the neighbours in a space that’s not commercial or defined by consumerism’. Another adds: ‘It’s a place where we do things collectively and connect with the earth, a place to be with people who have something in common, a part of the neighbourhood that’s really ours, unlike the park that’s cold and impersonal’. Agroecology, self-management and social ties are the three features that define their work at the local level, where people grow food and harvest social relationships. Because they are in the public space, the community gardens are highly visible, attractive experiences, and very active in making connections with other initiatives (community centres, neighbourhood associations, consumer groups, cyclists’ collectives, education associations and schools, for instance), which means that they reweave the local social fabric. As time goes by, the meeting space and relationships with other people become key to the group’s cohesion and competes in attractiveness with the gardening dimension, which was initially more relevant. As one gardener says, ‘When we didn’t know each other so well, we mostly talked about plants. Now we know each other we talk more about what’s going on in our lives’. Another gardener, the treasurer of one of the largest gardens in Madrid, Huerto Batán, expresses her motivation in similar terms: ‘Now, rather than the tomatoes, the important thing is relating to other people’. As well as the immediate activity, the community gardens prefigure what people would like their city to look like in the future, expressing the need for neighbourhoods that are more participatory, shared spaces, together with the introduction of more eco-urbanism (sustainable transport, proximity, renewable energies, composting, closing cycles). The community gardens were born in local communities that organized to regenerate degraded urban spaces on a small scale by occupying abandoned properties, spaces between buildings or underused green areas. These empty spaces once again became inhabited, combining a modest reconstruction of the site, emphasizing the use value of the urban space, with a relational rehabilitation that seeks to restore the quality of the space by intensifying social relations (organizing activities such as street parties, community meals or cultural initiatives). The protest side of the gardens was there from the start, revealing how far urban development policies and expert knowledge have diverged from the needs and aspirations of the city’s inhabitants. The action of occupying the space reflects the absence of ways to engage in a fruitful dialogue with local institutions, and reclaims the right of communities and citizens to take ownership of the public space and apply ‘collaborative planning and management practices to recreate it and think about what it should look like in the future’. 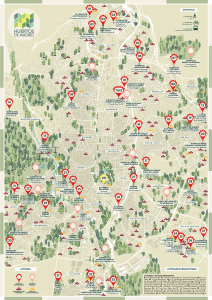 The movement began at the start of the twenty-first century with a few isolated initiatives taken forward by neighbourhood associations and ecologists, who by 2010 had set up coordination networks such as the Red de Huertos Urbanos Comunitarios de Madrid (RED). 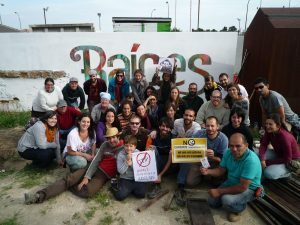 Since the 15M movement in 2011 many neighbourhood assemblies have been setting up gardens in different areas of Madrid, definitively locating this issue in the public sphere and putting it on the political agenda. The RED serves to raise the profile of all the initiatives, encourage the exchange of experiences (visits, meeting), share resources (seed nursery, seed exchange, buying manure collectively), create mutual support mechanisms and promote training events (learning days, courses), as well as offering a resource space that can provide advice and support to people and groups interested in taking forward new initiatives. Right from the start, the instability inherent in the occupation of land and the scarcity of resources led the RED to seek dialogue with the Madrid City Council, in order to regularize the status of the gardens and push for the launch of a municipal programme that would enable them to form part of the city’s green infrastructure on a permanent basis. 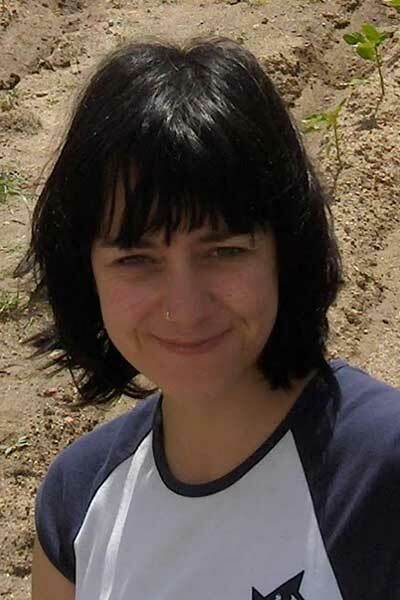 Between internal tensions and lengthy assembly meetings, sites being dismantled and occupied, protests and photo exhibitions, support from universities and international recognition (UN-HABITAT’s Good Practice Award for Urban Sustainability), the RED gained legitimacy as an interlocutor in negotiations. Following a lengthy hard bargaining with one of Spain’s most neoliberal municipal governments, the status of the first 17 community gardens was regularized in 2014. The gardens are located on sites categorized as green areas, and the right to use them is awarded in a public bidding process. In the list of terms and conditions a balance has been struck between respect for the uniqueness of citizen initiatives and their autonomy, while offering legal security to the City Council, in an innovative procedure that could be replicated in other cities. This major victory was won after exploring the shifting sands of dialogue with the city government, without dying in the attempt, proposing new forms of engaging with state institutions from positions of conflict and not just confrontation, eventually progressing towards dialogue and even cooperation. This giant step has enabled the community agriculture initiatives in the capital to consolidate and in just a few years to increase to nearly 60 regularized projects today. 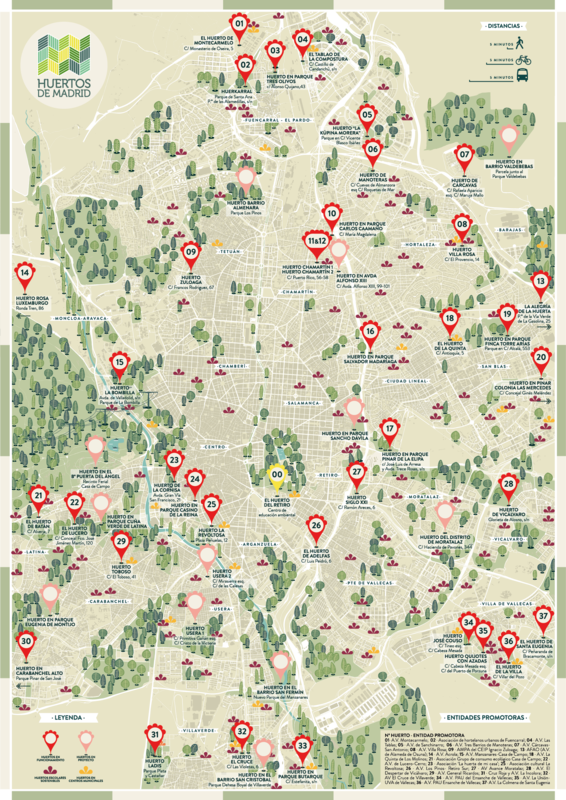 The community garden map is the opposite of a tourist map, which shows only the city centre, because the low-income neighbourhoods predominate, especially those on the outskirts where most initiatives are concentrated. In the city centre, where urban development is denser, it is much more difficult to find a physical space. Even so, the decisive variable is the thick social and neighbourhood fabric that the gardens require, which is more likely to be found in outlying neighbourhoods. The institutionalization process is in the early stages and is gradually becoming consolidated, respecting the autonomy and non-party-political nature of the initiatives. In addition, since a municipalist coalition took over the City Council in 2015 further steps have been taken, advancing the joint development of public policies aimed at recognizing and maximizing the creativity and collective intelligence in our cities, involving citizens and the social fabric in designing and implementing policies that concern them. This has led to the regularization of more gardens, including those located on non-residential land on a temporary basis, the building of the Municipal Urban Gardening School, consolidating a training plan to support community gardens jointly managed by the Red de Huertos, and the launch of a pilot project for community agro-composting. Municipalism is a walking paradox – discomforting to central government powers and business interests, but also to local counter-powers, who are obliged to leave their comfort zone, abandon the logic of resistance and accept a change in their identity that will enable them to play a leading role in a scenario where securing new rights becomes feasible. Counter-powers seen from above, powers seen from below. The ‘city councils for change’ find themselves in an unusual and paradoxical position between the pragmatism of the moment and the utopian impulse to bring about change. They are giving life to a space where it is possible to create more suitable ecosystems and environments for the experiments that are autonomously prefiguring another society. These are local governments that facilitate, support, and strengthen new forms of social institutions. The community gardens are organized as an assembly, where proposals are made and important decisions are taken. They also operate with working groups that are set up to coordinate specific tasks. Alongside these, are informal mechanisms based on thematic leadership – the person who knows about the specific topic and can take the initiative decides how to do it – and decision-making by those who are most often present in the space. 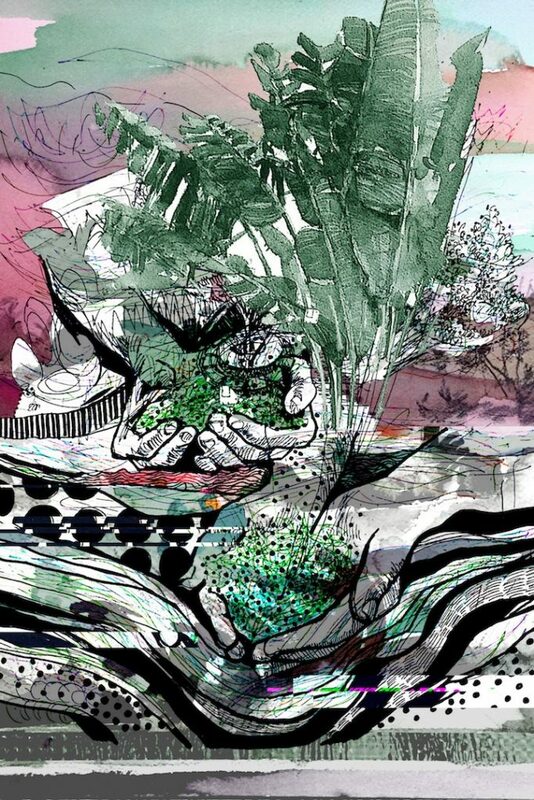 The work draws on the knowledge and experience of all the members, creating a climate of knowledge-sharing and ongoing, collective knowledge-production in response to the problems that arise. Tasks tend to be organized depending on each person’s preferences and knowledge, although there are mechanisms to ensure that people take turns to do the most unpleasant ones – such as sweeping or stirring the compost. A gardener from Adelfas, remarks how ‘there comes a time in this process when you have to do things you wouldn’t necessarily choose to. You might like the idea of spending the day with this person who’s a specialist in something and learn first-hand how they do their work, but you take responsibility and do whatever it’s your turn to do that day’. The harvest – a motivation more symbolic than material – is divided among everyone present and is seldom a source of conflict. However, care is taken to ensure that it is shared out fairly. On one occasion, an older man broke a bone in his foot while working in the garden and was unable to go back for some time, but his share of each harvest was set aside for him and someone would take it to his house since his work had helped to grow the vegetables. 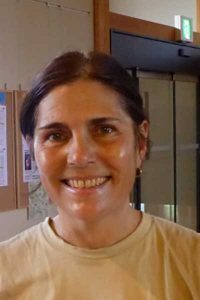 Some initiatives collect modest cash contributions from members, although people who cannot afford to pay are not excluded from joining the project. Others raise funds by making food or selling merchandise − badges, canvas bags, etc.− as well as by collecting voluntary individual contributions. The practice of urban ecological agriculture is often the main initial attraction. Later, working and spending time with other people means that relationships tend to become more important than the vegetable-growing tasks as such. Gradually, a network of relationships is woven and encourages solidarity and mutual support. Of course, as in any social setting, there are disagreements and disputes over how to manage the space or do the work, or because of misunderstandings. However, conflict is not usually seen as something to avoid, but rather an issue to be addressed. This is why some gardens in Madrid have developed their own regulations for dealing with conflict, and even make use of mediation processes through the RED. The difference between a group of islands and an archipelago is the existence of connections between them. Thus, once the gardens had put down roots in the neighbourhoods and become part of the social ecosystem, they and the RED focused on building bridges, gaining more allies, linking up with other campaigns and coordinating with other actors on various scales. The advocacy work done by the community garden goes beyond their own neighbourhoods and their influence extends to the city as a whole, where they are making their own specific contribution to changing the urban model. These projects are involved in multiple mobilization networks both at the urban and the translocal scale, linked to citizen participation, food sovereignty and agroecology. In 2015, the RED coordinated the First National Meeting of Urban Community Gardens. The ultimate aim is to transcend their own neighbourhood and become involved in a wider movement by connecting these islands to others, eventually consolidating ever-expanding archipelagos that break the bounds of established institutional structures and dominant practices. Madrid’s gardens have gained significant symbolic power as metaphors for social creativity, for citizens’ capacity to give abandoned spaces back their use value, for caring for nature in the city, and for the building of alternatives by autonomous citizens. 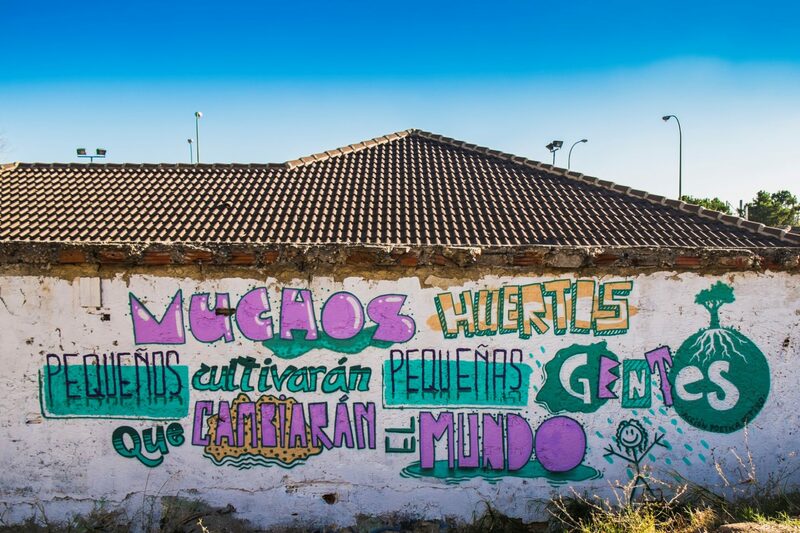 As well as mobilizing alternative ideas and becoming a means of protest, the community gardens have been a valid practical way to bring the organizational dynamics and critical discourses developed by the 15-M movement to neighbourhoods and municipalities. They are also fostering connections between the various pre-existing group or neighbourhood processes, thus diversifying their participant profile thanks to their constructive and inclusive nature. Locally, the community gardens bring together a range of feelings, demands and claims (environmental, neighbourhood, political, relational), while simultaneously stimulating processes of neighbourhood self-management that place emphasis on direct participation, taking ownership of the space, the rebuilding of identities and the shared responsibility of the community as a whole for the different issues that affect the people who live there. These exercises in micro-urbanism express people’s disagreement with the dominant model of the city and the lifestyles it induces. The community gardens are an expression of the emergence of a cooperative urbanism, intensive in citizen leadership and more democratic ways of understanding the public sphere. The gardens imply processes of urban rehabilitation, both in the form of small-scale material changes and, especially, in the form of relational rehabilitation, in how links are developed among people and between people and their surroundings. The community gardens act on the production and transformation of the urban space through their impact on human relationships and lifestyles rather than via major works of physical refurbishment. A habitable counter-power is one that allows people to experience in the here and now the major features of the future life to which we aspire, a process of immanent transformation that cannot be reduced to strategic calculations regarding the accumulation of forces and irreversible revolutions. 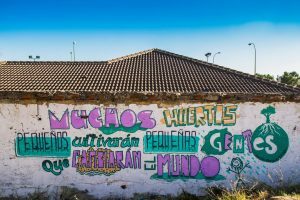 As a mural in one Madrid community garden says: ‘A garden doesn’t change the world; it changes the people who are going to change the world’. The challenge for these projects is to keep their more political contours without losing their capacity to bring about change. Originally published by the Transnational Institute under a Creative Commons Attribution-Noncommercial-No Derivative Works 3.0 license.